Although the term of hen vs. duck farm looks like a small one, actually it’s something more than that and a complex debate to come to a conclusion. That’s why it’s somehow difficult to make a sweeping generalization about either hen or ducks. It’s not only depending on your needs but it also depends on the specific breed of ducks or hens referencing. For example, if some breed for meat production then some for egg production. At the same time, some keep them for sociability or beauty. However, keeping chickens has been on the upswing over the last few years. It seems that backyard chickens have become all the rage whether it’s due to families wanting to know where their food is coming from or merely wanting to experience the sense of satisfaction. 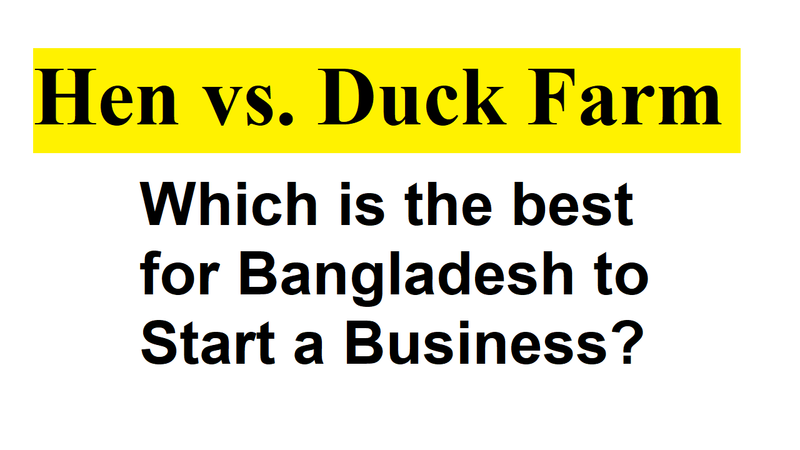 The distinct or quality of hen vs. duck farm will depend on their advantages and disadvantages. If you notice then you’ll understand that we haven’t said “chicken eggs” yet. And immediately get a mental image of a chicken when we hear the word “egg”. Also, we like to think the same. But, if you visit someone’s home who have ducks and ask about whether duck eggs are eatable, tasty then they will reply “yes” to all your questions. Although hens were the only viable option for producing healthy, delicious eggs had been shattered, the local duck eggs are able to continue feeding the newfound duck egg addiction. Moreover, when we imagine the context of Bangladesh, we’ll see that a lot of hen or chicken farmers are failed for a single time when their chicken get sick and start dying. But, if you talk to duck they are hard enough to resist some common diseases that hens can’t. On the other hand, ducks need open water body and some more space than hens. So, hens are easier to rearing in a small space than ducks. It means that hens and duck have their some special needs and demands, which are similar and distinct as well. Besides, if you visit the homestead of Bangladeshi people then you’ll find there are hens with almost every family, especially, those who live in rural areas. Duck eggs are not only bigger in size than hen but it contains more calories. Duck egg: 108 Kcal. Chicken egg: 75 Kcal. Hen eggs contain less nutritional punch, and beneficial omega 3s, minerals, and vitamins than duck eggs. As duck eggs come with a stronger, oilier taste than chicken eggs, the same can certainly be said when comparing the two types of meat. Because of the higher protein content of the egg, duck eggs are excellent for baking purposes. Hen’s eggs are acidic, but duck eggs are an alkaline-producing food. And it’s good as alkaline producing foods create anti-cancer conditions in the body. As duck eggs have a higher cholesterol content than chicken eggs, some nutritionists would say is a problem and others not. This is because it’s the good HDL cholesterol. And the last one, duck eggs have thicker shells than chicken eggs, allowing them to stay fresh for longer. Having more personality than chickens, Ducks appear to be smarter. Also, Ducklings and goslings (baby geese) will imprint on humans, but chickens are not. As ducks that are raised closely with humans, they can also learn to recognize faces. Since adult males, they become cocky and aggressive with no fear of humans, while they are sweet at a young age. You’re lucky if your chickens lay year-round without artificial lighting. But, we didn’t think so as all others don’t it. Although chickens may lay through their first winter, then laying tapers off to a halt each winter after, unless you add artificial light, and we don’t recommend doing so. But, ducks lay through the winter without artificial light and have higher egg production. On the other hand, ducks are more consistent egg layers than chickens while duck eggs are a little larger size than chicken eggs, taste a little richer with more Omega-3 fatty acids, higher Vitamin b12 levels. Also, duck eggs have 75% more Vitamin E than chicken eggs along with a thicker shell and a longer shelf life. And duck eggs are said to help prevent cancer as they have alkaline-producing food. Besides, there are some breeds are louder than others, for example, Ancona hens tend to be pretty loud. If you talk about roosters, not just at dawn, roosters crow night and day whenever they please. But, male ducks do not crow and others are far quieter than hens. So, ducks are definitely for you if you like peace and quiet. As ducks are so darn cute and adorable, they’ll melt your heart. The not only come in many colors but duck breeds and all of them are wonderful. Although hens may be beautiful and unique in their own way, no chicken can complete when it comes to silly bills and floppy webbed feet of baby ducklings. So, we are pretty sure that raising ducks will make you smile in the debate of hen vs. duck farm. But, it’s you who will decide in final that which one is the best for you as for your context. This is because you know your own better and also understand what we talked in the content.